This range of embossed ware was one of the first to be introduced by Carlton Ware in the early 1930s, the designs of which were carried over into a whole range of different embossed pieces. 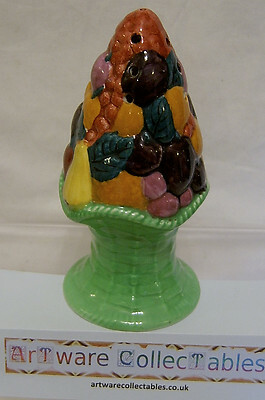 The 'Fruit Basket' design is always decorated in vivid colours, representing, not unnaturally, fruits and foliage created against a basket weave pattern. This Sugar Shaker/Sifter is no exception with the design centred around the top half of the item all set on a green ground. It is complere with a cork stopper. As ever, these products are highly glazed which, back in the 1930s, was considered to be an expensive design format thus ensuring that they did not remain in production for very long - hence their relative scarcity. It stands 5.5 inches (14 cms) tall with a base diameter of just over 2.5 inches (6.5 cms) . It is backstamped appropriately and there is just a trace of very light crazing, mainly on the underside. Other than it is in excellent condition.